He’s a brief survey of the safer ways to clean gutters. Ladders are now optional for gutter cleaning. However, if you’re comfortable with a ladder there’s the economical method of getting on top of the roof and blowing the gutters out with a leaf blower. However, chances are you aren’t interested in getting on a ladder at all. You’re looking for a smarter, safer way to clean the gutter, right? Then comes attachments you can add to your existing leaf blower to direct air through a tube into the gutters to blow the leaves and debris out of the gutters. I discovered a range of options from manufacturers like WORX, Toro and Sun Joe. Each gutter cleaning attachment is specific to their brand leaf blower. If this method appeals to you then you’ll have to use your brand specific attachment or if you’re a DIYer create your own. The website finehomebuilding.com has an article for the DIYer at heart. The attraction to the DIY solution is the ability to retrofit any brand blower you have and get to the second-floor gutters. Many of the marketed attachments appears to only reach the first-floor gutters. Blower attachments work great when the gutters have light fluffy leaves to remove. How about gutters with some aged debris that has broken down to slush and grim? The response for the hard-to-remove gutter debris is powered with good ole water. The water cleaning attachments can either attach to a regular garden hose or a pressure washer. 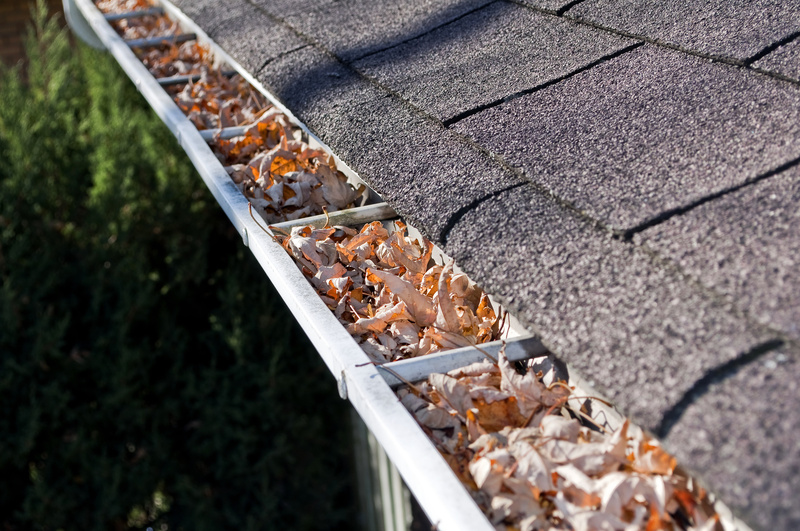 The added benefit is a more powerful force to push the leaves, dirt and grim down the gutters and into the downspouts. This allows you to visually inspect the flow of water and debris into the gutters, down the downspouts and watch how the water flow away from or toward the home. I hope the water flows away from the foundation. If not, you may want to add extension tubes to help the water go away from the home. The downside to using power wash attachments is the reduced reach. You may still have to get on a ladder to take full benefit of the cleaning power of water regardless if you are using a pressure washer or garden hose. The last category of smart gutter cleaning solutions I found for you are what I call grabbers. Gutterwhiz makes a true gutter grabbing solution that allows you to stand on the ground while using their tool to grad debris out of the gutters high above you. Another solution that is more of a sweeper is the Gutter Sweep gutter cleaning solution. This one attaches to an electric drill and has rotating brushes that sweeps debris out of the gutters above you while you stand safely on the ground. Well, whether you still enjoy getting on a ladder to clean the gutters and just read this article for entertainment or you found a new smarter and safer way to clean the gutters, thanks for allowing me to be of service to you. I would like to continue assisting you with useful information like this for your home maintenance and safety. Subscribe to our newsletter list for more information like this.